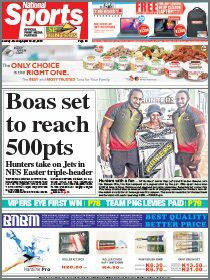 LAST December, a drunken brawl outside a nightclub in Boroko in the nation’s capital almost turned into a full-scale battle between the Defence and Police forces. The capital city was put on full alert the following morning as armed police cordoned off all entry points to Boroko Police Station while soldiers blocked off the nearby Murray Barracks. The standoff forced business houses in the central Boroko, 4-Mile and 3-Mile areas to close in fear of reprisals. Amid the confusion, opportunists took advantage with the lack of security to loot shops in Boroko and 3-Mile. Heavy traffic was diverted for several hours as senior police and military officers negotiated an amicable solution. By midday they had reached agreement on setting up a joint task force to investigate the confrontation. Deputy Police Commissioner and Chief of Operations Jim Andrews said at the time that senior police and military officers had drawn up terms of reference that would guide them and unveil the circumstances surrounding the confrontation. “I want to assure the business community that every effort is being made between senior police and military officials to lawfully and amicably resolve this issue,” he said. “We must not use our indifferences to undermine the rule of law which we, as servicemen and women, have sworn an oath to uphold. The Defence top brass and Police hierarchy were highly commended for given their assurance to city residents that peace between the two disciplinary forces would prevail and be maintained in the lead-up to and during the 2015 Pacific Games. 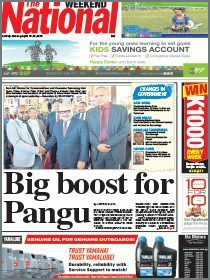 Then Defence Force Chief of Staff Col Vagi Oala said the standoff did not augur well for the country in the lead-up to the Pacific Games. Had it not been for the efforts of senior police and military officers like Andrews and Oala, the capital city could have been turned into a war zone as the police and army engaged in real combat. “The likely consequences were frightening as both forces are heavily armed, especially the Defence Force. The two forces kept their peace and assisted in the best and most successful Pacific Games in July. It seemed their truce was going to be long-lasting, even permanent. However, a group of soldiers decided last Thursday to re-ignite the dormant animosity by storming the Waigani Police Station and venting their frustrations over delays by the police to settle a feud between members of the two forces. The raid left two policemen with serious injuries to their head and bodies opportunists from the nearby market hurled rocks into the police station causing some damage. We agree with DCP Andrews that such unethical and unlawful acts should not be allowed to creep back into the disciplinary forces. “This type of behaviour is totally absurd and I am requesting the PNGDF management to look into this matter urgently,” he said. After 11 months of peace between the two forces, it seemed that all hell was going to break loose again. Fortunately, there have been no reports of further trouble between the military and police following the Waigani rampage. While people continue to express concerns about brutality cases involving both forces, it seems that indiscipline among their rank and file will remain a contentious issue until they effectively deal with it.